“Our people came from Lodge,” my father used to say, proudly mispronouncing the name of what is now Poland’s third-largest city by population. Yet I had no desire to visit the old country until my interest was piqued by hearing that the place where my ancestors sweated over sewing machines had metamorphosed into the country’s movie capital (Polanski and others studied at the renowned film school). A few years passed; with so many world-class European cities to visit, Lodz (pronounced "Woodge”)—indeed all of Poland—remained low on my travel radar. But the invitation I could not refuse was from a stylish boutique hotel within the former sweatshop itself; an opportunity to feast and drink vodka on the spot where my grandparents toiled a century ago for slave wages. Well, they do say living well is the best revenge. Lodz is both different and the same, I discovered on my sentimental and at times bittersweet journey. The sweatshops have gone, replaced by cafés and art galleries as well as warehouse-style hotel rooms, but the industrial redbrick shell remains. The nineteenth-century factories of Izrael Poznanski and his rival, Karl Scheibler, still tower over what used to be known as “the city of a thousand chimneys,” now reinvented as an entertainment hub. Manufaktura is what they call the Poznanski complex now, its landscaped center boasting a carousel, a zip line, and even a bungee jumping station. Despite the fact its gentrification is ongoing, today’s Lodz is well worth a visit, especially for the descendants of expats who escaped the city. From the exquisite new railway station whose diamond-patterned ceiling throws fantastic shadows onto the concourse to the futuristic science and technology center EC1, this is a town bent on prosperity through reinvention. Motivated by the desire to see where my great-grandmother lived after her children emigrated to London, Paris, and New York, and the plot where my great-grandfather is buried—all documented by impeccable records kept of the city’s turn-of-the-century residents—I took a trip just a few blocks from the smart Vienna House Andel’s Lodz hotel in the Poznanski complex to Baluty. It’s the slum into which country dwellers poured in the 1880s, drawn by what Nobel Prize-winning author Wladyslaw Reymont called The Promised Land. Apart from the opportunity to slave for minimal pay, it was no such thing; the tenements built for the textile workers were the diametric opposite of the Poznanski palace, which also overlooks the factory. Izrael spared no expense creating fabulous rooms with carved and gilded ceilings for himself and his family. But today’s Poland being what it is, rising determinedly from two centuries of foreign rule and the ashes of twentieth-century destruction, it will not be long before Baluty boasts vintage shops and cool bars within tenements like my great-grandmother’s old apartment house. I was grateful she left for London twenty-five years before the adjacent market square became a place of public execution (it is now a park). Baluty was the center of the Lodz Ghetto, Poland’s second largest, into which Jews from all over Europe were herded before being murdered or deported during World War II. To give credit to the city fathers, in 2004 they built Survivors Park to commemorate the Jews who escaped death and the locals who helped them. It’s a place of hope, unlike the gloom and doom of Radegast, the wooden station revived by the Nazis specifically for deportation purposes. Original cattle wagons of the period still stand on the platform, a chilling reminder of Lodz’s darkest days. Groups pour in from all over the world to see if their ancestors’ names are on deportation lists meticulously maintained by the Nazis. More poignant are the display cases full of brooches, buttons, and other ephemera retrieved from victims’ bodies; the first deportees were killed in their wagons at a depot just a few miles down the line. While the Jewish Cemetery has poignant rows of graves which recall veterans’ cemeteries in the United States, it’s also a place of great beauty, which I discovered when seeking out my great-grandfather’s grave. This landmark of funerary architecture boasts magnificent gravestones and mausoleums in contrast to the rows of simple markers. A succession of empty pits commemorates the last survivors of the Lodz Ghetto, forced to dig their own graves before escaping death when the Nazis beat a hasty retreat as the Russians advanced on the city. Stumbling through the tree roots that dot the alleys off the grand central avenue, I discovered that the maps which indicate ancestors’ plots so precisely on the cemetery website do not lead you instantly to the right grave. It’s necessary to pay the cemetery keeper to do some detective work—in my case hacking through the impenetrable jungle, only to find the gravestone matching the one in my old photograph in shape was for a different Goldberg than my great-grandfather Gierszon. But at least I had attempted to pay my respects. 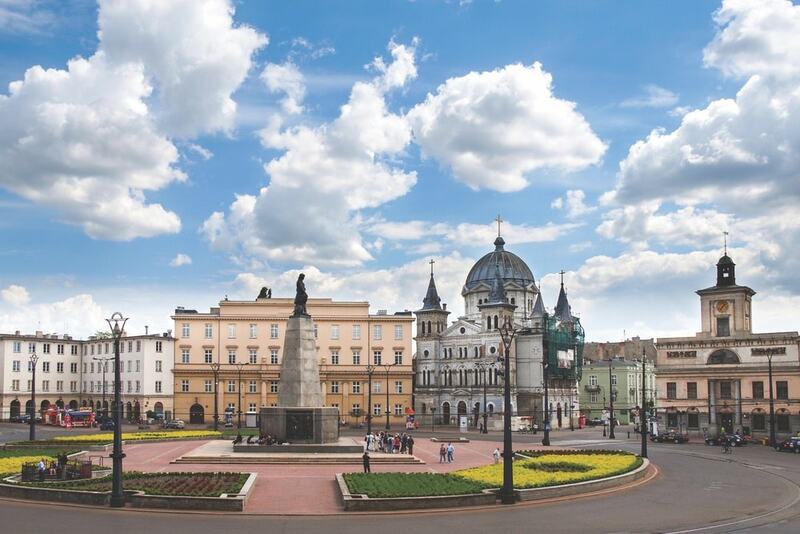 For those with no ancestor-hunting duties, today’s Lodz can be an entirely joyous place, underpinned by its beautiful broad, partially pedestrianized main boulevard, Piotrkowska Street, which runs for more than three miles. It’s the focus of dining and nightlife, packed on both sides with restaurants, bars, and cafés spilling on to the pavements in summer. The soup kitchens of old may have gone, but you can get an excellent bowl of borscht and a decent fillet of carp, bream, or herring nearly anywhere. 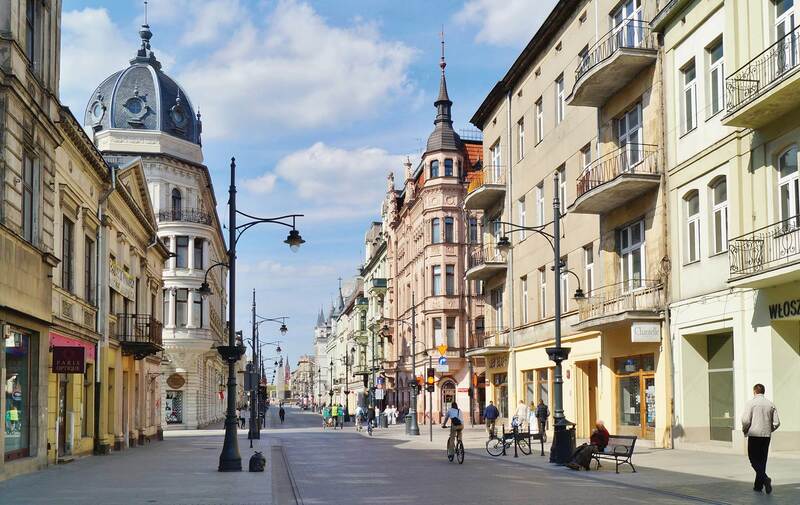 Piotrkowska Street is a visual as well as a culinary joy, with handsome buildings lining pavements punctuated by seated bronze statues of the city’s good and great, including pianist Artur Rubinstein, depicted at a grand embellished piano with wings. Street art is a big deal, with spectacular murals everywhere, even in impoverished Baluty. A most striking example stands opposite OFF Piotrkowska, a shopping and dining complex inside an industrial shell and courtyard that is somewhat less Disneyfied than Manufaktura. Andel’s Hotel is the obvious place to stay in Lodz, with spacious, brightly decorated rooms nodding to the city’s textile history, a spa, a sky bar overlooking Manufaktura, and an excellent restaurant. At least one night should be spent dining on Piotrkowska, and an interesting choice there is Klub Spadkobiercow, a fine dining establishment that now occupies the former home of banker Maximilian Goldfeder, who lived above the bank. Although I have no family connections in Warsaw, it seemed impossible to leave the country without also checking out Poland’s historic capital. And just as I had encountered a masterstroke of reinvention in Lodz, Warsaw proved a masterpiece of reconstruction. 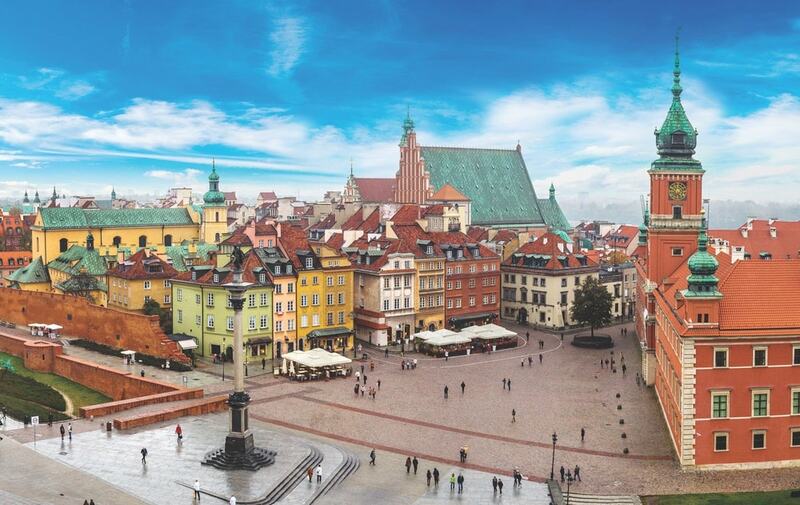 If the city remains undersung on the international tourism scene, it’s probably due to the mistaken perception that the fabulous architecture that earned Warsaw the nickname Paris of the East has disappeared. It’s true that Hitler razed the city to the ground after its citizens rose up in a futile attempt to overthrow the occupying Nazis, but astonishingly, the historic center was painstakingly rebuilt by the townspeople, brick by brick. The result is a city which combines the enchanting old town depicted in eighteenth-century paintings with a vibrant, futuristic new downtown. Both make an attractive base to stay and are equally central; however, the most happening district, Praga, is on the far side of the Vistula River, which bisects Warsaw. Praga has much in common with the eastern neighborhoods of Berlin, run-down but rapidly gentrifying, with low rents that attract creative types who are opening restaurants, bars, and clubs. Talking of restaurants, Warsaw may be unique in having both seriously haute cuisine and bargain-basement lunches in its repertoire; the latter are served at the “milk bars,” which came up in the postwar era to feed impoverished locals during the grim years of Communist rule. So-called because they specialized in vegetable and dairy dishes, they retain a retro fascination and are embraced by those seeking a decent meal for a few dollars. But who needs budget cuisine when gourmet delights are incredibly affordable? Visitors flock to celebrity chef Magda Gessler’s Restauracja Polka in the Old Town for traditional specialties downed with vodka. I dined for a song on beef tartare, which the country claims as its own invention, and roast duck at the Marconi Restaurant in the Bristol Hotel, itself a tourist attraction as one of the few remaining original buildings in downtown Warsaw. 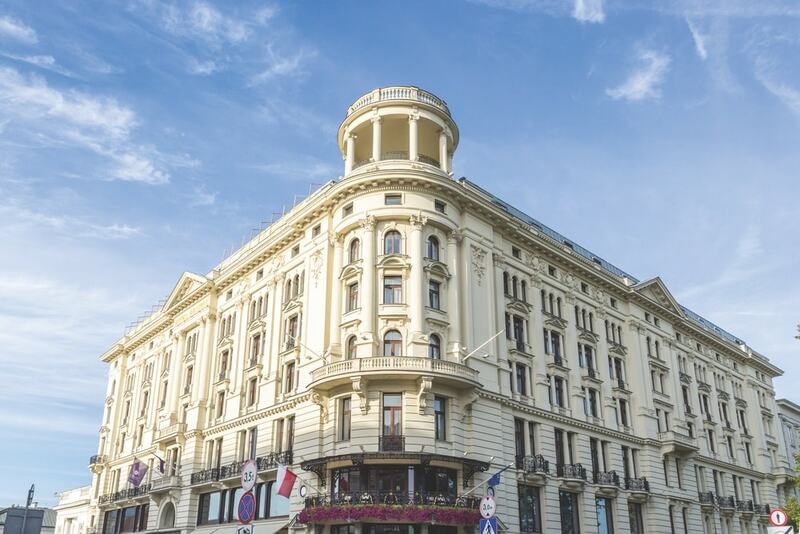 The Bristol, a triumph of 1901 architecture, is beautifully situated on the Royal Route that links the historic Old Town (its Market Square boasts a statue of the Mermaid of Warsaw, the city’s emblem, at its center) with downtown attractions like the Chopin Museum. Here, I gazed upon the composer’s piano, brought home to his birthplace after his death in Paris, and descended into the basement to hear waltzes, études, and mazurkas played through state-of-the-art headphones, a pursuit which will detain music lovers in the museum for hours. But even those who don’t have time to get there can enjoy Chopin’s music, which was strictly banned in Nazi Warsaw. His most famous works now play automatically for all who sit upon the information benches dotting the Royal Route. 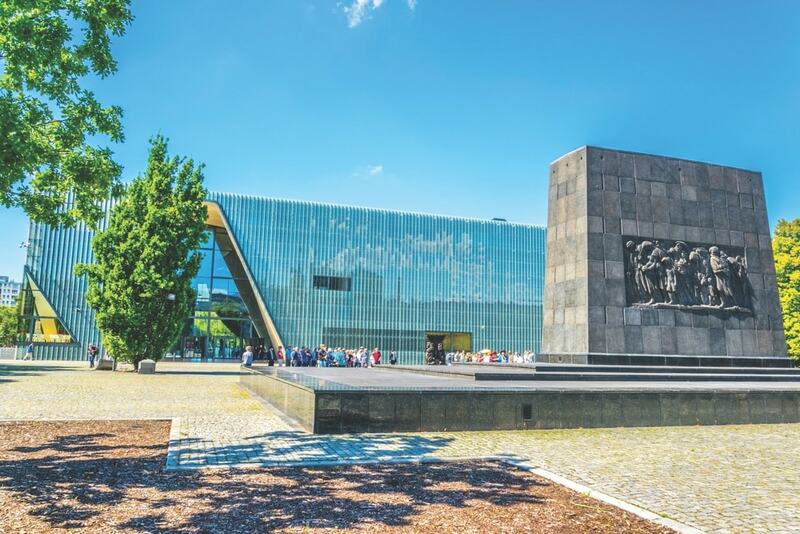 As for other museums, Warsaw is most distinguished today by the world-class POLIN Museum, paying multimedia tribute to a millennium of Jewish life in Poland. You don’t have to be Jewish to take in the story of a nation whose fortune has risen and fallen over the centuries, surviving occupation, partition, and near extinction, with tragedy befalling so many trapped in the wrong place at the wrong time. But Poles are resilient, and we descendants of the diaspora are testament to that. Those who stayed to witness independence and once-unimaginable prosperity are also warm and hospitable—and terrific cooks. 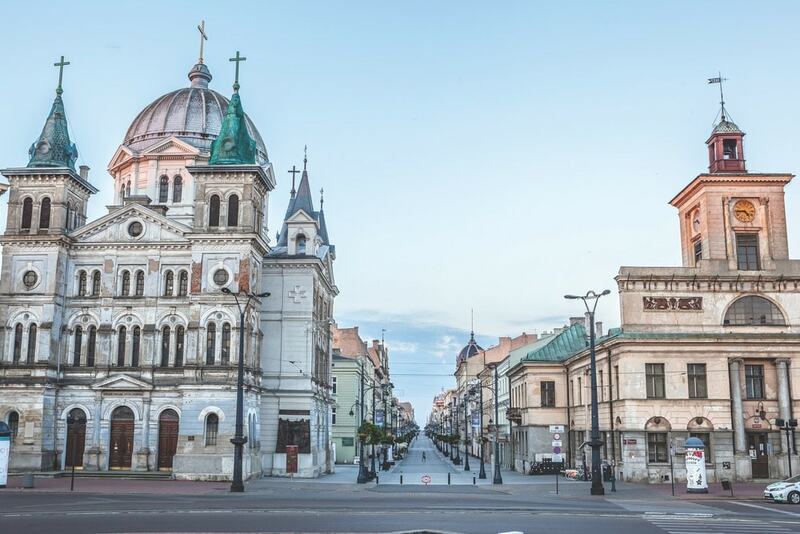 While the zloty remains such a bargain, it really is time to visit the old country and embrace its survival against all the odds. Warsaw’s top luxury hotel pick has to be the Bristol for its history, plush home comforts, and superb location on the Royal Route. A good midrange choice is the ultramodern Radisson Blu Centrum Hotel in the financial district (ask for one of the refurbished rooms on the top floor). Praga has a few good budget-priced options, such as the hip Hostel Krokodyl. If overnighting in Lodz, there’s no better choice than the Vienna House Andel’s Lodz, a fabulous conversion from factory to designer hotel right inside Manufaktura.